It happened again. I ran out of contacts lenses before I could get an appointment with my eye doctor to renew my prescription. I’m a busy mom. It happens. You might be reading this because it happened to you, too. I’ll admit – I did a quick search to see if there was any way I could order contacts online without a prescription. Nope. Still not legal – and for good reason. It’s important to have an eye doctor take a look at your peepers before signing off on your contact lens prescription. However if you have a computer with a webcam or a smart phone you don’t actually have to book an eye appointment, take time out of your schedule to attend the appointment, and wait 7-10 business days for your new contacts. Thanks to Simple Contacts I was able to complete an eye exam from the comfort of my home and my lenses arrived three days later. 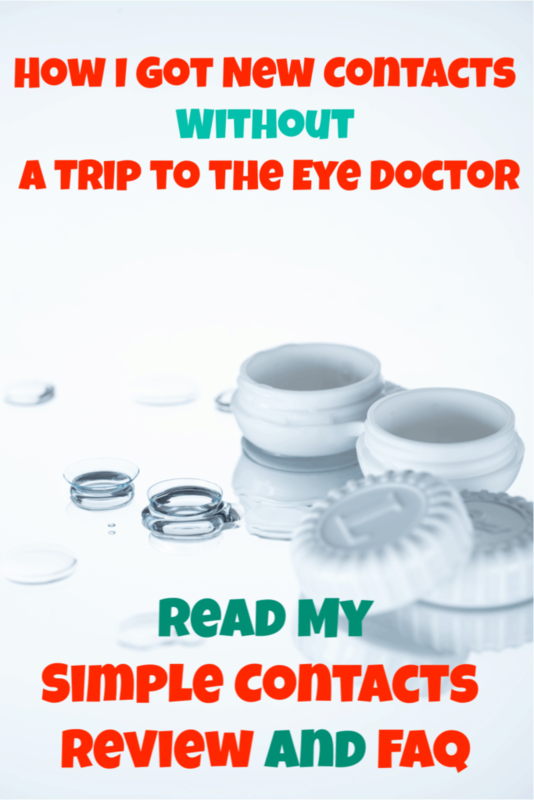 Read on to learn more about how Simple Contacts works and what I thought of my experience with Simple Contacts. If you’re just here for my Simple Contacts coupon code that’ll get you $20 off your first order – here it is . . .
How Does Simple Contacts Work? Simply put, Simple Contacts uses your computer or phone camera to perform an eye exam. Afterward a licensed eye doctor reviews the exam video and decides whether or not to prescribe contacts lenses to you. Do I Have to Have a Current Prescription to Use Simple Contacts? Sort of, yes. Sort of, no. To use Simple Contacts you need to be a contact lens wearer already. Simple Contacts renews contact lens prescriptions. However, if you have an expired prescription (like mine) and you’ve run out of contacts before visiting your eye doctor (like me) you can get your prescription renewed through Simple Contacts. How Much Does Simple Contacts Cost? I paid $20 for my initial eye exam. Simple Contacts has my lenses at the same price as other online contact lens sellers. Only, I didn’t have to buy a year’s supply to get a good price. I bought one box (for each eye – I have a different prescription for each eye) and got the same low price as I’d get for buying a several boxes elsewhere. In addition, I set up a subscription with Simple Contacts to deliver my lenses every three months, which gives me 10% off my orders. Because I didn’t have a pair of contacts to wear during my eye exam, Simple Contacts gave me an initial exam under one condition: If the eye doctor’s assessment found that I qualified for contact lenses they’d send me a limited number of lenses to wear for completing the full eye exam. I wouldn’t be able to order more lenses until I completed a full eye exam. I had my (now expired) prescription from my local eye doctor, so I went ahead with the first exam so I could get new contacts for the full exam. Simple Contacts gave me an initial exam to look for redness or other abnormalities. For the exam, video instructions guided me to move close to my camera and look up, right, and left. This allowed the doctor to examine my eyes for redness and other issues that might make me a poor candidate for contact lenses. At first, my exam was rejected because the lighting was too low in the room I was in. Then, I performed the exam outside where the sun cast a shadow across my face. My second exam was rejected. Finally, I fixed the lighting situation and my video was sent to an ophthalmologist. I was a little embarrassed about how many tries it took me to get the lighting right for the assessment, but I was glad that Simple Contacts took the exam seriously. When I received my contacts just three days later I immediately logged in to complete the exam with a fresh pair of lenses. They checked again for redness, etc and also for how well I could see with my lenses in. I used the Simple Contacts app on my smartphone. I placed my phone 10 feet away (the app can tell how far away you are and lets you know when you’re the correct distance) and read lines of letters with each eye separately and with both eyes together. This time I passed the exam on my first try and my prescription was renewed. One of the best parts of my Simple Contacts exam experience was the helpful communication along the way. When my first and second exams were rejected due to bad lighting, I received both an email and a text letting me know what happened, why the exam was rejected, and what the next step was. I was able to text back and receive a reply, so the process felt more real and less automated. Usually I wouldn’t mind an automated experience, but since this was my first time taking an online eye exam I appreciated the hand-holding. When my exam was approved I received another email and text. My renewed prescription was sent via email. As if failing the eye exam twice wasn’t humbling enough, I accidentally entered my existing prescription wrong when I signed up. Let’s call it mom-brain and move on, shall we? Fortunately, I easily messaged Simple Contacts and they updated the numbers for me before my lenses were sent. My first and second orders from Simple Contacts arrived within three days. What more can I say about that? I’ve always had to wait 7-10 business days and then go to the doctor’s office to pick up my lenses. Getting my contacts from Simple Contacts was unexpectedly quick. As if competitive contact lens prices and free shipping weren’t enough, Simple Contacts also offers a subscription program with a 10% discount. Low prices, free shipping, and a discount. Oh my! Now I don’t have to worry about running out of contacts and they’re kind of paying me for the convenience. Yes, please! I have VSP vision insurance that will pay for a portion of my contact lens expense each year. Simple Contacts provided an emailed receipt containing the information I need to submit a claim to VSP. At the time of this writing my claim has been submitted and I’m waiting on the response from VSP. Simple Contacts is likely considered an out-of-network provider, so I don’t expect to receive a full reimbursement. However, I haven’t always had vision insurance and have paid far more per year for exams and contact lenses than I will this year by using Simple Contacts. After using them myself and having a great experience I recommend Simple Contacts. When you become a customer Simple Contacts gives you a referral link to share with others.